The #6050 is a single level home, 2,609 square feet with 4 bedrooms and 2 full bathrooms. From the porch, enter this house towards a combined formal dining room and living room. The kitchen overlooks the family room. The kitchen has a separate island and also offers a breakfast nook. The family room is adjacent to the living room. Some model s chose an option of an additional fireplace and a wet bar. Next to the family room is a hallway leading to the second, third, and fourth bedroom. 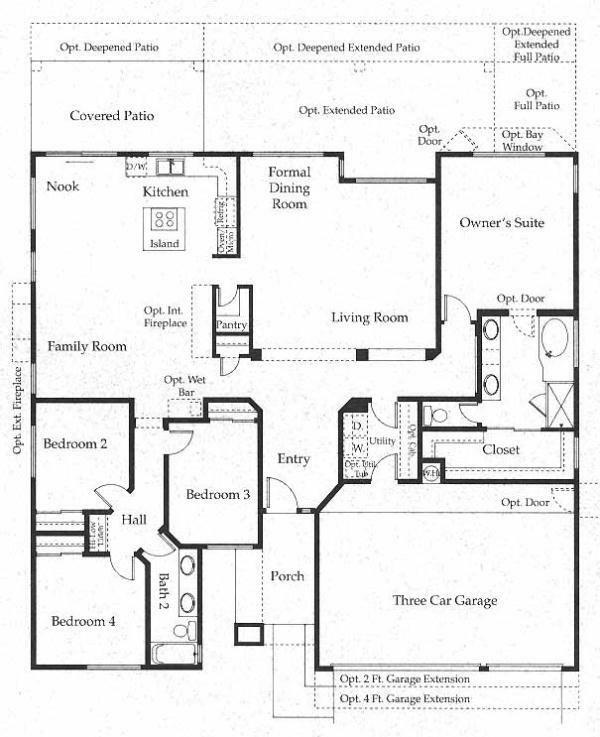 The second full bathroom is located in between the third and fourth bedroom. This model also offers an option to convert the second bedroom into a den, an optional extended patio, optional bay window, and optional deepened extended patio. On the other side of the house right after the main door is a hallway leading to a very spacious master bedroom. It has a master bathroom with two separate sinks, a separate tub and shower, and also boasts a very large walk in closet. The utility room is located close to the main entrance.